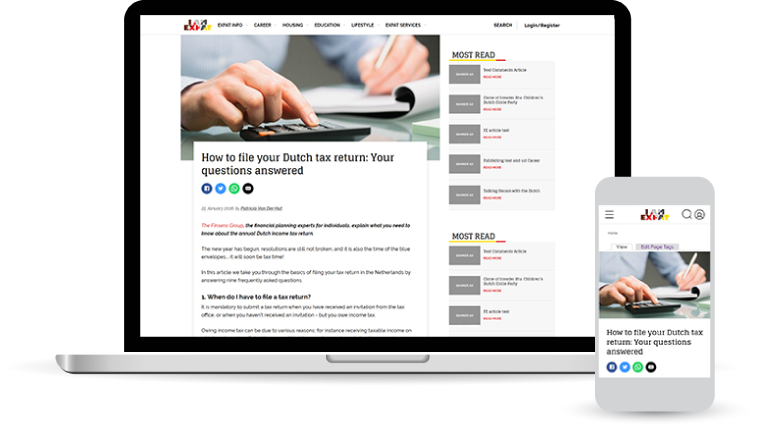 Founded and run by expats, IamExpat.nl is the leading English-language media platform providing up-to-date information, news, job listings, housing services, events and lifestyle tips for internationals in the Netherlands since 2009. Expatriates are hard to reach via traditional media advertising platforms. IamExpat offers a direct channel to the growing international community of highly educated, multilingual and career-oriented individuals. 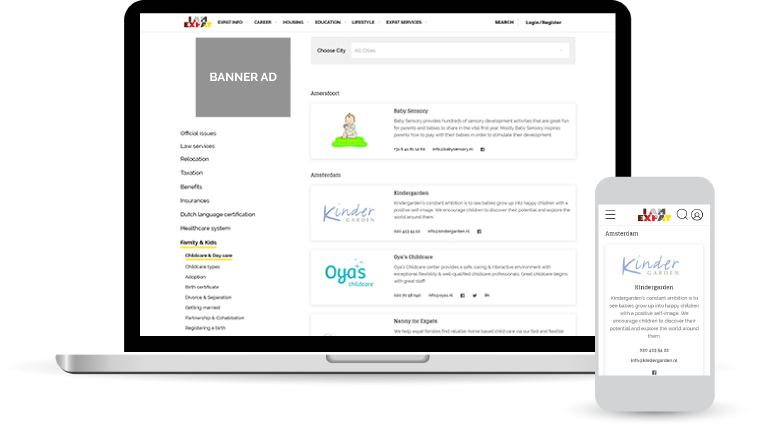 With our modern and user-friendly website, advertising campaigns are delivered in the most eﬀective and engaging way, across all desktop and mobile devices. Using insights and data on the expatriate market, IamExpat has helped hundreds of companies from various industries to generate awareness and targeted leads for their products and services. 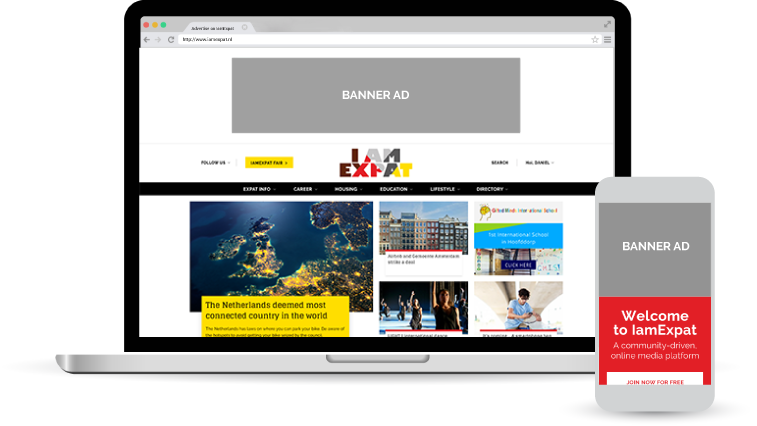 Banner campaigns on IamExpat increase brand awareness and demand for advertiser's products and services. IamExpat’s stylish and user-friendly online environment, accessible across all desktop and mobile devices, generates high visibility and increased CTR. 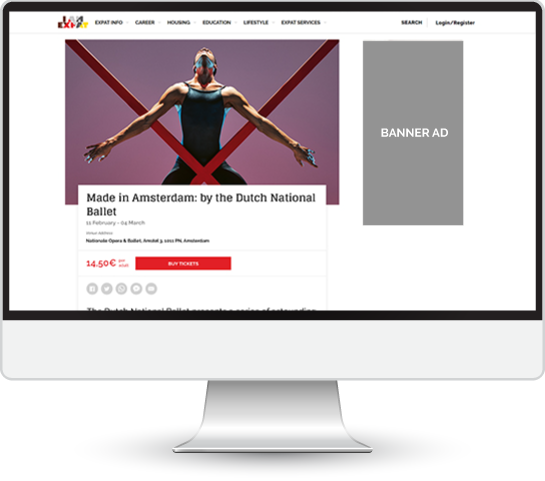 Using diﬀerent banner types, which are displayed on content-speciﬁc sections, relevant geographic locations and pre-deﬁned time periods, the campaigns are delivered to the right audience based on a guaranteed number of impressions. Using our long term experience in the expat market and a good understanding of your needs, the IamExpat Team also oﬀers marketing advice and banner design services. IamExpat oﬀers a unique publishing platform that advertisers use to share information and promote their services and products. Having your articles or advertorials published on IamExpat gives your business legitimacy and creates positive awareness and lead generation. Your content is being distributed to thousands of expats via the IamExpat platform, the weekly newsletters and the social media networks. With the assistance and guidance of our experienced editorial and account management teams, advertisers publish SEO friendly content suitable for social media: features (advertorials), informative articles, events or competitions. IamExpat promotes listings of recommended, expat-friendly businesses from various industries and service sectors. The business listings are successful lead and traﬃc generation tools, for small and large businesses alike. The renewal ratio of these yearly advertisements is higher than 90%. Dutch language courses (per city) - English language course (per city) - MBA programs - International Schools (per city) - Rental housing agencies - Short stay (per city) - Moving Companies - Recruitment agencies - Career coaches - Dutch tax services - Dutch law firms - Childcare (per city) - Relocation Agencies - Real Estate agencies - Phychologists - Dentists (per city) - Mortgages - Financial advisors - Fitness & Training (per city) - Coworking & Office spaces (per city). Reach thousands of IamExpat members directly by using the email marketing advertising option. Our team creates mobile-friendly emails based on the advertiser's in-house design style or by using our own customizable templates. Email marketing campaigns generate high conversions thanks to geo-targeting and engaging call-to-actions to the advertiser's website. The IamExpat’s Lifestyle section is the go-to place for internationals. Hundreds of festivals, cultural events, theater or dance performances, concerts, kids events and exhibitions are promoted every year. Organisers use IamExpat to eﬀectively inform the international community about their events and increase attendance and ticket sales. The IamExpat Fairs are the leading expat market events designed to connect local businesses and the international community in the Netherlands. Whether you want to promote your services, introduce new products, build brand awareness or network, these truly international, one-day events are the perfect opportunity! The annual IamExpat Fairs in Amsterdam and The Hague attract more than 5.000 unique visitors and 135 exhibitors every year as well as 45 presentations & workshops. IamExpat Jobs has been developed to help recruiters attract international talent and assist expats with a vital need. 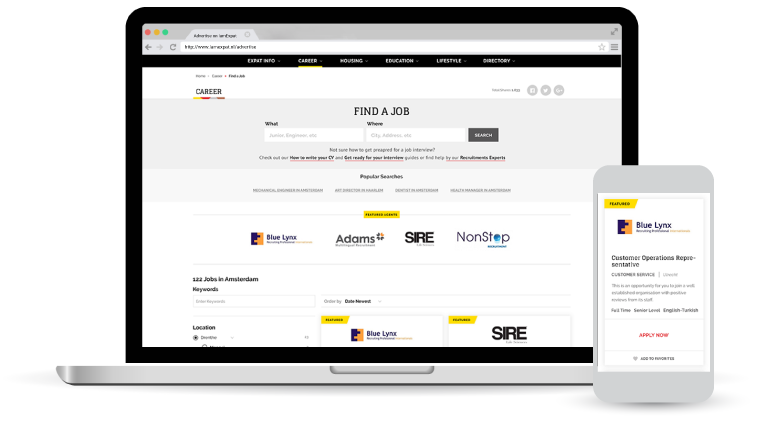 Companies and recruitment agencies that want to hire international candidates in the Netherlands can post (in English) without any cost. Available options include manual posting, XML feed and multi-posting platforms (Broadbean, InGoedeBanen, Knollenstein). Companies and recruitment agencies that have used IamExpat Jobs include Adams Multilingual Recruitment, Atlassian, Booking.com, Codeguild, Fairfood, Groupon, International Court of Justice, Laureate Online Education, Madison Parker, Nova Engineering, Octagon Professionals, Projob, Travel Bird, Undutchables, Unique Multilingual and many more. 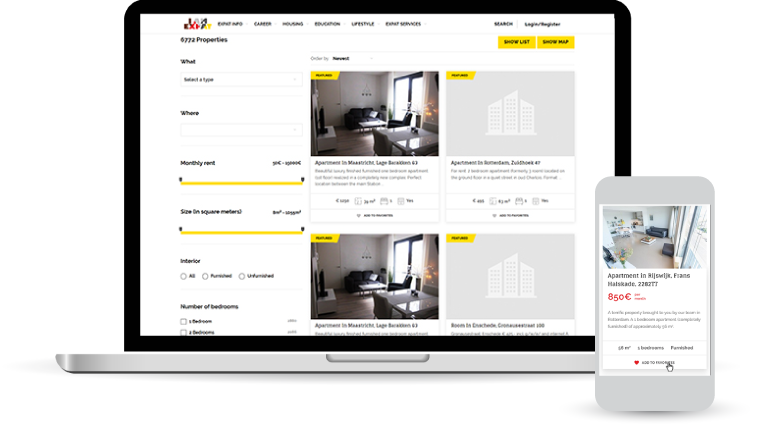 Feature your properties in the top search results to get maximum exposure and receive targeted, quality leads directly. The properties will appear at the top of the search results as long as these match the search criteria. Apart from all recently uploaded properties, you are also able to promote one property of your preference for a speciﬁc period. This property will be featured at the top of the search results, as long as it matches the search criteria.